There is a story about a young job candidate interviewing for an entry-level position in the geography department of a state university. One senior faculty member, whose opinion of our modern educational system was not especially high, asked the simple question, "Which way does the Mississippi River run?" In ignorance of the biases of this particular geography department and in fear of jeopardizing his employment prospects, the candidate boldly replied, "I can teach it either way." When the question "Is Milton Friedman a Keynesian?" was first suggested to me as a topic, I couldn't help but think of the uncommitted geographer. But in this case, opposing answers can be defended with no loss of academic respectability. When teaching at the sophomore level to students who are hearing the names "Keynes" and "Friedman" for the first time, I provide the conventional contrast that emerges naturally out of the standard account of the "Keynesian Revolution" and the "Monetarist Counter-Revolution." To claim otherwise would come close to committing academic malpractice. Either a casual survey or a careful study of the writings of Keynes and Friedman reveals many issues on which these two theorists are poles apart. Yet, one can make the claim that Friedman is a Keynesian and remain in good scholarly company. Both Don Patinkin (Gordon, 1974) and Harry Johnson (1971) see Friedman's monetary theory as an extension of the ideas commonly associated with Keynes. Some of their arguments, however, run counter to those of the Austrian school, which serves as a basis for this chapter. And while Friedman, by his own account, was quoted out of context as saying, "We're all Keynesians now," his in-context statement is thoroughly consistent with an Austrian assessment. More than two decades ago, during an interview with a reporter from Time magazine, Friedman commented that "in one sense, we are all Keynesians now; in another, no one is a Keynesian any longer." The two senses were identified in his subsequent elaboration: "We all use the Keynesian language and apparatus; none of us any longer accepts the initial Keynesian conclusions" (Friedman 1968b, p. 15). Patinkin and Johnson have each argued that Friedman's attention to the demand for money, and particularly his inclusion of the rate of interest as one of the determinants of money demand, puts him closer to Keynes than to the pre-Keynesian monetary theorists. Friedman has responded by insisting that the inclusion of the interest rate in the money-demand function is a minor feature of his theoretical framework (Gordon, 1974, p. 159). Austrian monetary theorists, who pay more attention to the interest rate than does Friedman and as much attention to it as did Keynes, have a different perspective on the interest-rate issue. Both Keynes and Friedman have neglected the effects of change in the interest rate on the economy's structure of capital. From an Austrian viewpoint this sin of omission, which derives from a common "language and apparatus," makes both Keynesianism and Monetarism subject to the same Austrian critique. It is important to note, then, that the sense in which the statement "We're all Keynesians now" is true�from both a Monetarist and an Austrian perspective�involves a circumscribed "all." Monetarists are included; Austrians are not. Drawing out the essential differences among these schools of thought requires that we begin by considering the common "language and apparatus" that predates Friedman's (1969a) restatement of the quantity theory of money and that predates even Keynes's General Theory. The Austrians can be identified as Keynesian dissenters on the basis of Keynes's earliest macroeconomics. Keynes's two-volume Treatise on Money, which appeared in 1930, was not well received by economists who drew their inspiration from Carl Menger and Eugen von Böhm-Bawerk. Although the macroeconomics found in Keynes's Treatise is not readily recognizable today as Keynesian theory, the theoretical building blocks and methods of construction are largely the same. The macroeconomic aggregates of saving, investment, and output are played off against one another in a manner that establishes equilibrium values for the interest rate and price level. In an extended critique of this early rendition of Keynesianism, F. A. Hayek found many inconsistencies and ambiguities, but his most fundamental dissatisfaction derived from Keynes's mode of theorizing�from his "language and apparatus": "Mr. Keynes's aggregates conceal the most fundamental mechanisms of change" (Hayek, 1931a: p. 227). Keynes had argued that changes in the rate of interest have no significant effect on the rate of profit for the investment sector as a whole. Hayek's point was that profit reckoned on a sector-wide basis is not a significant part of the market mechanism that governs production activity. A change in the rate of interest means that profit prospects for some industries rise, while profit prospects for others fall. The systematic differences in profits rates among industries, and not the average or aggregate of those rates, are what constitute the relevant "mechanisms of change." There were fundamental shifts in Keynes's thinking during the six years between his Treatise and his General Theory, but none that could be considered responsive to Hayek's critique. In the General Theory, impenetrable uncertainty about the future clouded the decision processes of investors and wealth holders; the interest rate became a product of convention and psychology, largely if not wholly detached from economic reality; changes in market conditions were accommodated by income adjustments rather than price or interest-rate adjustments; and unemployment equilibrium became the normal state of affairs. Selective readings of what Keynes actually wrote�as well as creative readings of what he may have intended to write�have given rise to conflicting interpretations of Keynes's message. In many instances, disagreements about Keynesian answers to macroeconomic questions derive from disagreements about what the relevant macroeconomic questions are. Is Keynes asking: How, in particular, do markets actually work? Or is he asking: Why, in general, do they not work well? More specifically, does the interest-inelastic demand for investment funds enter importantly into his theory, or does the instability of investment demand, driven as it is by the "animal spirts" of the business world, swamp any consideration of interest inelasticity? Does the highly interest-elastic demand for money enter importantly into his theory, or does the instability of money demand, based as it is on the "fetish of liquidity," swamp any consideration of interest elasticity? Interpreters such as G. L. S. Shackle (1974) and Ludwig M. Lachmann (1986, pp. 89-100 and passim), who focus on the pervasive uncertainty that enshrouds the future and the utter baselessness of long-term expectations, impute great significance to the animal spirts, as they affect the bulls and bears in investment markets, and to the fetish of liquidity, as it affects their willingness to make a commitment to either side of any market. Wealth holders are sometimes more willing, sometimes less willing, to part with liquidity; speculators are sometimes bullish, sometimes bearish, in their investment decisions. Such behavior gives rise to continuously changing market conditions and to a continuously changing pattern of prices. The sequential patterns of prices in a market economy, predictable by neither economist nor entrepreneur, are likened to the sequential patterns of cut glass in a kaleidoscope. There certainly is no reason to expect, in this vision of the market process, that prices, wage rates, and interest rates will be consistent with the coordination of production activities over time or even that they will be consistent with the full employment of labor at any one point in time. "Keynesian Kaleidics," as this strand of Keynesianism is sometimes called, is not so much a particular understanding of the operation of a market economy as a denial that any such understanding is possible. Clearly, Friedman is not a Keynesian in this sense. 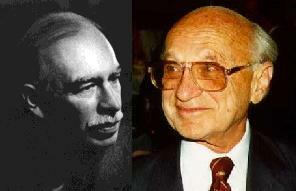 Interpreters such as John Hicks (1937) and Alvin Hansen (1947), whose focus penetrated Keynes's cloud of uncertainty, have identified a set of behavioral relationships which, together with the corresponding equilibrium conditions, imply determinate values of total income and the interest rate. (1) In the most elementary formulation, net investment (I) must equal net saving (S), and the demand for liquidity (L) must be accommodated by the supply of money (M). This ISLM framework, more broadly called income-expenditure analysis, has in many quarters�but not in Austrian ones�come to be thought of as the analytical apparatus common to all macroeconomic theories. Appropriate assumptions about the stability of investment and money demand, interest elasticities, and price and wage rigidities allow for the derivations of either Keynesian or Monetarist conclusions. Within the context of income-expenditure analysis, it is appropriate to think of Friedman's Monetarism as being directly opposed to Keynesianism. Although both Keynesianism and Monetarists accept the same high level of aggregation, one which closes off issues believed by the Austrians to be among the most important, they have sharp disagreements about the nature of the relationships among these macroeconomic aggregates. Several such disagreements, many as reported or implied by Friedman (1970), are included in the following list. 1. Keynesians believe that the interest rate, largely, if not wholly, a monetary phenomenon, is determined by the supply of and demand for money. Monetarists believe that the interest rate, largely a real phenomenon, is determined by the supply of and demand for loanable funds, a market which faithfully reflects actual opportunities and constraints in the investment sector. 2. In the Keynesian vision, a change in the interest rate has little effect on (aggregate) investment; in the Monetarist vision, a change in the interest rate has a substantial effect on (aggregate) investment. This difference reflects, in large part, the short-run orientation of Keynesians and the long-run orientation of Monetarists. 3. Keynesians conceive of a narrowly channeled mechanism through which monetary policy affects national income. Specifically, money creation lowers the interest rate, which stimulates investment and hence employment, which, in turn, give rise to multiple rounds of increased spending and increased real income. The nearly exclusive focus on this particular channel of effects, together with the belief that investment demand is interest-inelastic, accounts for the Keynesian preference for fiscal policy over monetary policy as a means of stimulating or retarding economic activity. Government spending has a direct effect on the level of employment; money creation has only an indirect and weak effect. Monetarists conceive of an extremely broad-based market mechanism through which money creation stimulates spending in all directions�on old as well as new investment goods, on real as well as financial assets, on consumption goods as well as investment goods. Nominal incomes are higher all around as a direct result of money creation, but with a stable demand for money in real terms, the price level increases in direct proportion to nominal money growth so that real incomes are unaffected. 4. Keynesians believe that long-run expectations, which have no basis in reality in any case, are subject to unexpected change. Economic prosperity is based on baseless optimism; economic depression, on baseless pessimism. Monetarists believe that profit expectations reflect, by and large, consumer preferences, resource constraints, and technological factors as they actually exist. 5. Keynesians believe that economic downturns are attributable to instabilities characteristic of a market economy. A sudden collapse in the demand for investment funds, triggered by an irrational and unexplainable loss of confidence in the business community, is followed by multiple rounds of decreased spending and income. Monetarists believe that economic downturns are attributable to inept or misguided monetary policy. And unwarranted monetary contraction puts downward pressure on incomes and on the level of output during the period in which nominal wages and prices are adjusting to the smaller money supply. 6. Keynesians believe that in conditions of economy-wide unemployment, idle factories, and unsold merchandise, price and wages will not adjust downward to their market-clearing levels�or that they will not adjust quickly enough, or that the market process through which such adjustments are made works perversely as falling prices and falling wages feed on one another. Monetarists do not believe that such perversities, if they exist at all, play a significant role in the market process. They believe instead that prices and wages can and will adjust to market conditions. The fact that such adjustments are neither perfect nor instantaneous is, in the Monetarists' judgment, no basis for advocating governmental intervention. A market process that adjusts prices and wages to existing market conditions is preferable to a government policy that attempts to adjust market conditions to existing prices and wages. The contrast between Keynesianism, as interpreted by Hicks and Hansen, and Monetarism, as outlined by Friedman (Gordon 1974), is based upon their common analytical framework. The recognition of this common framework underlies the assessment by Gerald P. O'Driscoll and Sudha R. Shenoy (1976, p. 191) that "Monetarism... does not differ in its fundamental approach from the other dominant branch of macroeconomics, that of Keynesianism. "(2) But the Keynesian/Monetarist income-expenditure analysis, no less than the analysis in Keynes's Treatise on Money, is subject to Hayek's early criticism. The aggregates conceal the most fundamental mechanisms of change. While many of the conflicting claims can be reconciled in terms of the short-run and long-run orientation of Keynesians and Monetarists, respectively, and in terms of their contrasting philosophical orientations, neither vision takes into account the workings of failings of the market mechanisms within the investment aggregate. Austrian macroeconomics(3) is set apart from both Keynesianism and Monetarism by its attention to the differential effects of interest rate changes within the investment sector, or�using the Austrian terminology�within the economy's structure of production. A fall in the rate of interest, for instance, brings about systematic changes in the structure of production. A lower interest rate favor production for the more distant future over production for the more immediate future; it favors relatively more time-consuming or roundabout methods of production as well as the production and use of more durable capital equipment. The "mechanisms of change" activated by a fall in the interest rate consist of profit differentials among the different stages of production. The market process that eliminates these differentials reallocates resources away from the later stages of production and into the earlier stages; it gives the intertemporal structure of production more of a future orientation. The ultimate consequence of this capital restructuring brought about by a decrease in the rate of interest depends fundamentally upon the basis for the decrease. If the lower rate of interest is a reflection of an increased willingness to save on the part of market participants, then the capital restructuring serves to retailor the production process to fit the new intertemporal preferences. Continual restructuring of this sort�along with technological advancement�is the essence of economic growth. If, however, the lower rate of interest is brought about by an injection of newly created money through credit markets, then the capital restructuring, which is at odds with the intertemporal preferences of market participants, will necessarily be ill-fated. The period marked by the extension of artificially cheap credit is followed by a period of high interest rates when cumulative demands for credit have outstripped genuine saving. The artificial, credit-induced boom will necessarily end in a bust. Accounting for the artificial boom and the consequent bust is no part of Keynesian income-expenditure analysis, nor is it an integral part of Monetarist analysis. The absence of any significant relationship between boom and bust is an inevitable result of dealing with the investment sector in aggregate terms. The analytical oversight derives from theoretical formulation in Keynesian analysis and from empirical observation in Monetarist analysis. But from an Austrian perspective, the differences in method and substance are outweighed by the common implication of Keynesianism and Monetarism, namely that there is no boom-bust cycle of any macroeconomic significance. In the General Theory, the interest rate is sometimes treated as if it depends on monetary considerations alone, such as in Chapter 14, where Keynes contrasts his own theory of interest with the classical theory. The supply of and demand for money (alone) determine the equilibrium rate of interest, which in turn determines the level of investment and hence the level of employment. The essentially one-way chain of determinacy makes no allowance for the pattern of saving and investment decisions to have any effect upon the rate of interest While this rarified version of Keynesian macroeconomics has not survived the translation from the General Theory to modern textbooks, it can by easily represented as a special case of the ISLM construction, one in which the LM curve is a horizontal line that moves up or down with changes either in liquidity preferences or in the supply of money. Using more formal terminology, the system of equations is recursive, such that the rate of interest can be determined independently of the other endogenous variables. Within this framework, there is simply no scope for a boom-bust cycle as envisioned by the Austrians. More tellingly, Keynes perceives a one-way chain of causation from money supply as a policy variable to investment (and hence employment) as a policy goal. The monetary authority increases the money supply; the interest rate falls until money demand exhausts supply; investment increases, as does employment. A new equilibrium is established in which the rate of interest is permanently lower and the levels of investment and employment are permanently higher. In the income-expenditure framework, the temporal pattern of investment does not enter into the analysis, and the distinction between a genuine boom and an artificial boom is itself an artificial distinction. Keynesian analysis does not disprove the Austrian idea that a credit-induced boom leads to a bust. By adopting a higher level of aggregation, it simply fails to bring this issue into focus. Nor is the Austrian idea disproved by the Monetarists, who rely on a highly aggregated statistical analysis for clues about the relationship between booms and busts. Levels of aggregate output that characterize a typical downturn do not correlate well with a preceding upturn, but the magnitude of the downturn does seem to be related to the magnitude of the succeeding upturn. 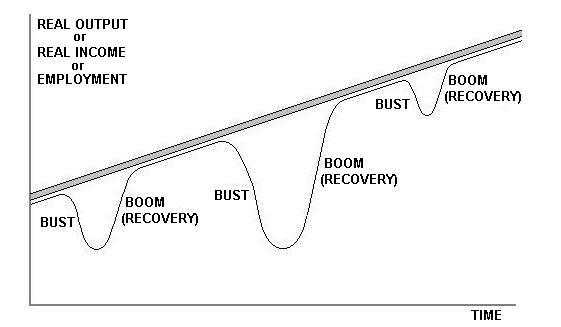 In the Monetarists' empirical analysis, there appears to be a bust-boom, rather than a boom-bust cycle. Friedman (1969b, pp. 27-277) has offered what he calls a "plucking model" of the economy's output over the period 1879-1961. (6) Imagine a string glued to the underside of an inclined plane. The degree of incline represents long-run secular growth in output. If the string were glued at every point along the inclined plane, it would represent an economy with no cyclical problems at all. Cyclical problems of the type actually experienced can be represented by plucking the string downward at random intervals along the inclined plane. In this representation of the economy's actual growth path, the economic process that gives us healthy secular growth occasionally comes "unglued." While the consequent sagging of economic performance is unrelated to the previous growth, recovery to the potential growth path is necessarily related to the extent of the sag. But for the slight degree of incline, there would be a one-to-one relationship between downturn and subsequent recovery. On the basis of this Monetarist representation, the Austrian ideas are rejected, not so much on the basis of the answers offered, but on the basis of the questions asked. What is the market process that turns a boom into a bust? There is no empirical evidence that suggests any such process to be at work. What is the market process that turns a slump into a recovery? This is the empirically relevant question, in the Monetarists' view. The suggested answer, which has the flavor of textbook Keynesianism, involves the conventional operation of market forces in the face of institutional price and wage rigidities (Ibid., p. 274). As Friedman clearly recognizes, the dismissal of the possibility of a boom-bust cycle and the empirical identification of the bust-boom cycle both derive from the inherent asymmetry of deviations from the potential growth path. The economy's output can fall significantly below its potential level, but it cannot rise significantly above it. The fact that Friedman's formulation is in terms of aggregate output, however, suggests that the Austrian critique of early Keynesianism is equally applicable to modern Monetarism: Professor Friedman's aggregates conceal the most fundamental mechanisms of change. The economy's output consists in the output of consumer goods plus the output of investment goods. An artificially low rate of interest can shift resources away from the former category and into the latter. More importantly, it can skew the pattern of investment activities toward production for the more distant future; it can overcommit the investment sector to relatively long-term projects. Such money-induced distortions are wholly consistent with the changes in aggregate output over the nine-decade period studied by Friedman. In terms of the plucking model, the Monetarists observe that some segments of the string are glued fast to the inclined plane and other segments are not. But in terms of their macroeconomic aggregates, there is nothing in the nature of the string�or the glue�as we move along a glued section toward an unglued one that explains why the glue fails. Monetarists instead conceive of the string as plucked down by some force (an inept central bank) that is at work only on the segments that constitute the downturn. The Austrians, working at a lower level of aggregation, examine the makeup of the string (the allocation of resources within the investment sector) and the consistency of the glue (the rate on interest and pattern of prices upon which resource allocation has been based during the boom). They conclude that if the interest rate has been held artificially low by monetary expansion, the intertemporal allocation of resources is inconsistent with actual intertemporal preferences and resource availabilities. The string is destined to become unglued. Friedman's plucking model is more notable for the aspects of the market process it ignores than for the general movements of macroeconomic aggregates it represents. Movements in the rate of interest and consequences of those movements for the allocation of resources within the macroeconomic aggregates play no role in either Monetarism or Keynesianism. In fact, the very choice of a particular level of aggregation reflects a judgment about which aspects of the market process are significant enough to be included in macroeconomic theory. Relationships between the aggregates are significant; relationships within the aggregates are not. The aggregates chosen by Keynes were accepted by Friedman, indicating that the two theorists made the same judgment in this regard. Their bases for judgment, however, are not the same. Opposing views about the nature and significance of the rate of interest and of changes in that rate underlie the decisions by Keynes and Friedman to neglect the considerations that are so dominant in Austrian macroeconomics. All three views can be identified in terms of the interest-rate dynamics first spelled out by the Swedish economist Knut Wicksell. The natural rate of interest, so called by Wicksell, is the rate consistent with the economy's capital structure and resource base. If allowed to prevail, it would maintain an equilibrium between saving and investment�and would also keep constant the general level of prices. The bank rate of interest, by contrast, is a direct result of bank policy. Credit expansion lowers the bank rate; credit contraction raises it. Macroeconomic equilibrium can be maintained, according to Wicksell, only by a monetary policy that keeps the bank rate equal to the natural rate. (7) Therefore, a banking system that pursues a cheap-credit policy (by holding the bank rate of interest below the natural rate) throws the economy into macroeconomic disequilibrium. While the Austrians, beginning with Mises (1971), adopted Wicksell's formulation as the basis for their own theorizing, deviating from it only in terms of the consequences of a credit-induced macroeconomic disequilibrium, neither Keynesians no Monetarists share Wicksell's concern about the relationship between the bank rate and the natural rate. In summary terms, Keynes denied that the concept of the natural rate had any significance; Friedman, who accepts the concept, denies that there can be deviations of any significance from the natural rate. Although Keynes had incorporated a modified version of Wicksell's natural rate in his Treatise on Money, he could find no place for it in his General Theory. In the earlier work, full employment was the norm; and the (natural) rate of interest kept investment in line with available saving. In the later work, the rate of interest is determined, in conjunction with the supply of money, by irrational psychology (the fetish of liquidity), and the level of employment accommodates itself to that interest rate. Keynes argued that " there is ... a different natural rate of interest for each hypothetical level of employment" and concluded that "the concept of the 'natural' rate of interest ... has [nothing] very useful or significant to contribute to our analysis" (Keynes 1936, pp. 242-43). In Friedman's Monetatism, competition in labor markets gives rise to a market-clearing wage rate, which singles out from Keynes's hypothetical levels of employment the one level for which labor supply is equal to labor demand. The concept of the natural rate of interest, that is, the rate that clears the loan market and keeps investment in line with savings, fits as naturally into the Monetarists' thinking as it fits into Wicksell's. In fact, Friedman coined the term "natural rate of unemployment" to exploit the similarity between the Wicksellian analysis of the loan market and his own analysis of the labor market (Friedman, 1976, p. 228). According to Wicksell, a discrepancy between the bank and the natural rates of interest gives rise to a corresponding discrepancy between saving and investment; according to Friedman, a discrepancy between the actual and the natural rates of unemployment reflects a corresponding discrepancy between the real wage rate, as perceived by employers, and the real wage rate, as perceived by employees. Macroeconomic disequilibrium plays itself out in ways that eventually eliminate such discrepancies in loan markets (for Wicksell) and in labor markets (for Friedman). While the Wickesll-styled dynamics in labor markets have been of some concern to Monetarists, the corresponding loan-market dynamics play no role at all in Monetarism. The bank rate of interest never deviates from the natural rate for long enough to have any significant macroeconomic consequences. Whatever effects there are of minor and short-lived deviations are trivialized by Friedman as "first-round effects" (Gordon, 1974, pp. 146-48). That is, the initial lending of money, the first round, is trivial in comparison to the subsequent rounds of spending, which may number twenty-five to thirty per year. Friedman summarily dismisses all such interest-rate effects, as spelled out by modern Keynesians (Tobin) and by Austrians (Mises), and affirms that his own macroeconomics is characterized by its according "almost no importance to first-round effects" (Ibid., p 147). Austrian macroeconomics is distinguished from the macroeconomics of both Keynes and Friedman by its acceptance of the Wicksellian concept of the natural rate and by its attention to the consequences of a bank-rate deviating from the natural rate. It is distinguished from Wicksellian macroeconomics, however, in terms of the particular consequences taken to be most relevant. For Wicksell (1936, pp. 39-40 and passim), a deviation between the two rates puts upward pressure on the general level of prices. If, for instance, the natural rate rises as a result of technological developments, inflation will persist until the bank rate is adjusted upward. A relatively low bank rate may create "tendencies" for capital to be reallocated in ways not consistent with the natural rate, but those tendencies do not, in Wicksell's formal analysis, become actualities. Real factors continue to govern the allocation of capital, while bank policy affects only the general level of prices (Ibid., pp. 90 and 143-44). But because both the Swedish and the Austrian formulations are based upon Böhm-Bawerkian capital theory, the particular "tendencies" identified by Wicksell correspond closely to the most relevant "mechanisms of change" spelled out by Hayek. Also, Wicksell's informal discussion, which accompanies his formal exposition, gives greater scope for actual quantity adjustments within the capital structure (Ibid., pp. 89-92). For the Austrians, the effects of a cheap-credit policy on the general level of prices is, at best, of secondary importance. If in fact the discrepancy between the two rates of interest is attributable to technological developments, as Wicksell believed it to be (Ibid., p. 118), then the resulting increase in the economy's real output would put downward pressure on prices, largely, if not wholly, offsetting the effect of the credit expansion on the price level. If, alternatively, the discrepancy is more typically attributable to inflationist ideology, as Mises (1978a, pp. 134-38) came to believe, then, in the absence of any fortuitous technological developments, the credit expansion would put upward pressure on prices in general. Still, this general rise in prices, this fall in the purchasing power of money, is of less concern to the Austrians than the changes in relative prices that result from the artificially low bank rate of interest. The "tendencies" for reallocation within the capital sector acknowledged by Wicksell become "actualities" in the Austrian view. The market process is not so fail-safe as to preclude any investment decision not consistent with the overall resource constraints. Newly created money put into the hands of entrepreneurs at an artificially low interest rate allows them to initiate production processes that eventually conflict with the underlying economic realities (Hayek, 1967c, pp. 69-100). Where Wicksell claimed that tendencies toward reallocation do not become actualities, the Austrians claim that actual reallocations induced by credit expansion are unsustainable. The artificial boom ends in a bust. In his discussion of Keynesian and Austrian concerns about interest-rate effects, Friedman claims that the importance of ultimate effects, as compared to first-round effects, is an empirical question (Gordon 1974, p. 147). The Austrians recognized that ultimately, after boom, bust, and recovery, empirical analysis would reveal no lingering effects of the initial credit expansion on the bank rate of interest relative to the natural rate. The economy overall would be less wealthy for having suffered a boom-bust cycle, and hence the natural rate itself might well be higher. But the relative magnitudes of the initial and ultimate effects is no basis for ignoring the market process that produced them. The first-round effects constitute the initial part of a market process that plays itself out within capital and resource markets; the loss of wealth and possible increase in the natural rate is the ultimate effect of that same market process. Although Friedman does not engage in process analysis in his treatment of the interest rate as it is affected by credit expansion, he does engage in process analysis in his treatment of the wage rate as it is affected by price-level inflation (Friedman, 1976, pp. 221-29). The first-round effects consist of a discrepancy between two wage rates: the rate as perceived by the workers and the rate as perceived by the employer. Such a discrepancy occurs in the early phase of an inflation because the employer immediately perceives the difference between the price he pays for labor and the newly increased price of the one product he produces, while workers perceive, but belatedly, the general increase in the prices they pay for consumer goods The ultimate effect of price-level inflation is a rising nominal wage rate, which maintains a real wage rate�as perceived (correctly) by both employers and workers�consistent with the natural rate of unemployment. Friedman could have made the claim, in connection with these labor-market dynamics, that "the importance of the ultimate effects in comparison to the first-round effects is an empirical question." Undoubtedly, direct empirical testing�if data could be obtained on the differing perceptions of wage rates�would show the ultimate effects to be dominant. But Friedman does not dismiss his own analysis with a rhetorical question about an empirical test. Instead, he sees the first-round effects as the initial part of a market process that plays itself out within labor markets, and he sees the reestablishment of the natural rate of unemployment as the ultimate effect of that same process. There is empirical evidence consistent with both the Monetarist treatment of labor markets and the Austrian treatment of credit markets. The unsustainablility of an inflation-induced boom in labor markets and of a credit-induced boom in capital markets is suggested by a natural rate of interest and a natural rate of unemployment that are independent of monetary policy. Data on inflation rates and unemployment rates for the last several decades must be accounted for in terms of some market process through which monetary expansion has an initial effect, but not a lasting one, on real magnitudes. Whether the most relevant market process is one working through labor markets or one working through credit markets is a matter of logical consistency, plausibility, and historical relevance. (8) And, of course, Monetarist labor-market dynamics and Austrian capital-market dynamics can be seen as partial, complementary accounts of the same, more broadly conceived market process. This comparison of Monetarism and Austrianism in the context of the dynamics of an unsustainable boom seems to create an alliance between these two schools against Keynesianism. The allied account of an artificial boom that contains the seeds of its own destruction stands in contrast to the Keyensian account of a bust attributable to a sudden and fundamentally unexplainable loss of confidence in the business community. But the alliance is only a tactical one. Any theory of a boom-bust cycle is inconsistent with Friedman's plucking model, which suggests that there are no such cycles to be explained. The original context in which Friedman offered his account of the inflation-induced labor market dynamics makes the inconsistency understandable. Friedman was not attempting to identify a market process that fits neatly into his own Monetarism. Instead, he was demonstrating the fallacy of a politically popular Keynesian belief that there is a permanent trade-off between inflation and unemployment. Based upon the empirical study done by A. W. Phillips in the late 1950s, many Keynesians came to believe that the inverse relationship between rising nominal wages and unemployment constituted a menu of social choices and that policymakers should acknowledge the preferences of the electorate by moving the economy to the most preferred combination of inflation and unemployment. Friedman was willing to do battle with the Keynesian optimizers on their own turf. Accounting for the inverse relationship in terms of a misperception of wages, he was able to show that the alleged trade-off existed only in the short run and therefore did not constitute a sound basis for policy prescription. There is no evidence, however, that he considered these labor-market dynamics to be an integral part of his own macroeconomics, although some Monetarists, notably Edmund S. Phelps (1970), and most textbook writers have taken them to be just that. (9) Neither Keynesianism, as represented by ISLM analysis, nor Monetarism, as represented by Friedman's plucking model, acknowledges the boom-bust cycle as a part of our macroeconomic experience. Austrianism is set apart from the other two schools in this regard. And, by adopting a fundamentally different framework at a lower level of aggregation, the Austrians have been able to identify the capital-market dynamics essential to the understanding of such cycles. In the broad sweep of the history of macroeconomic thought, the Wicksellian theme, in which there can be a temporary but significant discrepancy between the bank rate and the natural rate of interest, constitutes an important watershed. A significant portion of twentieth-century macroeconomics can be categorized as variations of this Wicksellian theme. Included indisputably in this category are followers of Wicksell in Sweden: Gustav Cassel, Eric Lindahl, Bertil Ohlin, and Gunner Myrdal; Wicksell-inspired theorists in Austria: Ludwig von Mises and, following him, F. A. Hayek; and British theorists working in the tradition of the Currency school: Ralph Hawtrey, Dennis Robertson, and taking his cue from the Austrians, the early Lionel Robbins. Excluded from this category are those theorists who deny, ignore, or downplay the Wicksellian theme, typically by adopting a level of macroeconomic aggregation too high for that theme, in any of its variations, to emerge. Exemplifying these theorists are Irving Fisher and, following him, Milton Friedman. Even Don Patinkin, who draws heavily on Wicksell's ideas about the dynamics of price-level adjustments, belongs to this group. His chosen level of aggregation, which combines consumer goods and investment goods into a single aggregate called commodities, precludes from the out set any non-trivial consequence of the discrepancy between the bank rage and the natural rate. Axel Leijonhufvud (1981, p. 123) bases his own interpretation of Keynes on a similar grouping of theorists. Wicksell and Fisher are at the headwaters of two separate traditions labeled "Saving-Investment Theories" and "Quantity Theory." Leijonhufvud makes Keynes out to be a Wicksellian, but he does so only by patching together a new theory with ideas taken selectively from the Treatise and the General Theory. This interpolation between Keynes's two books is designated "Z-theory" (Ibid., pp. 164-69). Drawing from the first book, it allows for a natural rate of interest from which the bank rate can diverge, and drawing from the second book, it allows for the resulting disequilibrium to play itself out through quantity adjustments rather than through price adjustments. Leijonhufvud's hybrid Keynesian theory gives play to the Wicksellian theme and fits comfortably in the list of "Saving-Investment" theories. With the exposition of his "Z-theory," Leijonhufvud has clearly identified himself as a Wicksellian. (10) To claim, however, that Keynes himself was a Wicksellian is to engage in counter-factual doctrinal history. In the Treatise, the discrepancy between the bank rate and the natural rate did not have a significant effect on the saving-investment relationship; in the General Theory, significant disturbances to the saving-investment relationship were not attributed to a discrepancy between the two rates. By offering his Z-theory in support of Keynes's candidacy as a Wicksellian, Leijonhufvud tacitly admits that Keynes had actually managed to skirt the Wicksellian idea first on one side, then of the other. The categorization of theorists defended in this chapter differs importantly from Leijonhufvud's in that Keynes is transferred�on the basis of what he actually wrote�to the other side of the Wicksellian watershed. Keynes's chosen level of aggregation, together with his neglect of Wicksellian capital-market dynamics, establishes an important kinship to Fisher, Friedman, and Patinkin. Hayek's early "Reflections on the Pure Theory of Money" might well have been entitled "Is Keynes a Quantity Theorist?" Nearly half a century after his critique of the Treatise, Hayek explicitly categorized "Keynes's economics as just another branch of the centuries-old Quantity Theory school, the school now associated with Milton Friedman" (Minard, 1979, p. 49). Keynes, according to Hayek, "is a quantity theorist, but modified in an even more aggregative or collectivist or macroeconomic tendency" (Ibid.). The Wicksellian watershed, as employed by Leijonhufvud, makes a first-order distinction between broad categories of theories on the basis of subject matter. In one category, the subject is saving and investment and the market process through which these macroeconomic magnitudes are played off against one another. In the other category, the subject is the quantity of money and the market process through which changes in the supply of or demand for money affect other real and nominal macroeconomic magnitudes. An alternative first-order distinction, more in the spirit of Hayek's critique of Keynes, is one based on alternative levels of macroeconomic aggregation. The notion of a Wicksellian watershed might well be supplemented by the notion of an Austrian sieve. In one broad category of theories, the level of aggregation is low enough to allow for a fruitful exploration of the Wicksellian theme. In the other category, the level of aggregation is so high as to preclude any such exploration. Based on their high levels of aggregation, then, both Keynesianism and Monetarism fail to pass through the Austrian sieve. This is the meaning of Hayek's claim that Keynes is a quantity theorist and of the corresponding claim that Friedman is a Keynesian. 1. This interpretation is almost universally attributed to Hicks (on the basis of his early article) and to Hansen (on the basis of his subsequent exposition). Warren Young (1987) makes the case that, on the basis of the papers presented at the Oxford conference in September 1936, credit for the ISLM formulation should be shared by John Hicks, Roy Harrod, and James Meade. 2. Friedman clearly recognizes his kinship to Keynes in terms of their fundamental approach: "I believe that Keynes's theory is the right kind of theory in its simplicity, its concentration of a few key magnitudes, its potential fruitfulness. I have been led to reject it not on these grounds, but because I believe that it has been contracted by experience" (Friedman, 1986, p. 48). Allan H. Meltzer identifies the type of theorist that produces Keynes's kind of theory: "Keynes was the type of theorist who developed his theory after he had developed a sense of relative magnitudes and of the size and frequency of changes in these magnitudes. He concentrated on those magnitudes that changed most, often assuming that others remained fixed for the relevant period" (Meltzer, 1988, p. 18). This method is not as laudable as it may seem. If subtle changes in credit and capital markets induce significant but difficult-to-perceive changes in the economy's capital structure, then Keynes's�and Friedman's�method is much too crude. Surely, the job of the economist is to identify market processes even when�or especially when�the relevant market forces do not have direct or immediate consequences for some macroeconomic aggregate. 3. Austrian macroeconomic relationships are spelled out in various contexts by Ludwig von Mises (1966), F. A. Hayek, (1967), Lionel Robbins (1934), Murray Rothbard (1970, 1983), Gerald P. O'Driscoll, Jr. (1977), and Roger Garrison (1989, 1986). 5. The relative emphasis on secular unemployment, as compared to cyclical unemployment, is consistent with Meltzer's interpretation of Keynes (Meltzer, 1988, pp. 196-210). In most modern textbooks, involuntary unemployment is taken to mean cyclical unemployment. In Meltzer's view, which is more faithful to the General Theory and to Keynes's long-held beliefs about capitalistic economies, cyclical unemployment is a minor component of involuntary unemployment (Ibid., p. 126). 6. Although there is no explicit reference to Hayek or other Austrian theorists in his article, the plucking model is clearly intended as a basis for rejecting the general category of theories which account for the boom-bust cycle. 7. It is recognized both by modern Austrian theorists and by Wicksell's contemporaries that the equivalence of the bank rate and the natural rate is consistent with price-level constancy only in the special case of constant output. If the economy is experiencing economic growth, then maintaining a saving-investment equilibrium will put downward pressure on prices, and conversely, maintaining price-level constancy will cause investment to run ahead of saving. 8. An assessment of the logical consistency, plausibility, and historical relevance of these two perspectives on monetary dynamics is undertaken in Bellante and Garrison (1988). 9. Friedman's Wicksell-styled analysis of labor-market dynamics stands in direct conflict with his fourth-listed Key Proposition of Monetarism, according to which "the changed rate of growth of nominal income [induced by a monetary expansion] typically shows up first in output and hardly at all in prices" (Friedman, 1970, p. 23). In his subsequent Phillips curve analysis, misperceived price increases precede and are the proximate cause of increases in output. For an extended discussion of this inconsistency, see Birch et al. (1982); for an attempt at reconciliation, see Bellante and Garrison (1988, pp. 220-21). 10. But "Leijonhufvud the Wicksellian" remains a puzzle to modern Austrian economists. In his exposition of the Wicksellian theme, Leijonhufvud grafted Wicksell's credit-market dynamics onto neoclassical capital theory and appended the following note: "Warning! This is anachronistically put in terms of a much later literature on neoclassical growth. Draining the Böhm-Bawerkian capital theory from Wicksell will no doubt seem offensively impious to some, but I do not want to burden this paper also with those complexities" (Leijonhufvud, 1981, p. 156). Then, in his restatement of the critical arguments, Leijonhufvud reveals his own judgment on natters of capital theory: "Like the Austrians,...I would emphasize the heterogeneity of capital goods and the subjectivity of entrepreneurial demand expectations." If Leijonhufvud had emphasized Austrian capital theory as the stage on which the Wicksellian theme was to be played out, he would have left Keynes in the wings and followed that theme from Wicksell to Hayek.